William Aldridge came from Bredenbury, nr. Bromyard, Herefordshire. He attended The Minster College in Leominster and was very keen on Rowing & Martial Arts. 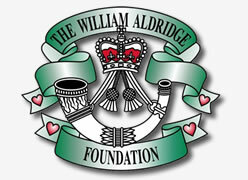 Rifleman Will Aldridge joined C Company 2 Rifles in Ballykinler, Northern Ireland in December 2008 at seventeen years of age, after attending The Army Foundation College, Harrogate and completing his Infantry Training in Catterick. He completed pre-deployment training for Afghanistan with his Platoon, but was unable to deploy on tour until he turned 18 on 23rd May 2009. Rifleman Aldridge played a key role with the Battalion’s Rear Party in Ballykinler, guarding the families of those already in Afghanistan until he was old enough to deploy himself. He duly deployed on 26th May 2009 and was fiercely proud of being one of the very youngest British Soldiers serving in Helmand Province. Rifleman Aldridge was one of five soldiers from 2nd Battalion the Rifles who lost their lives on 10th July 2009, in a series of I.E.D explosions whilst on foot patrol in what was reported to be a Joint Forces Exercise, not far from their base at FOB Wishtan in the Sangin District of Helmand ... and one of eight to perish within 24hrs. 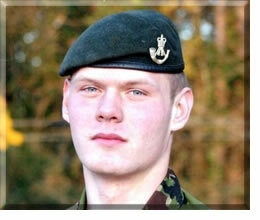 He still remains the youngest soldier to have been killed at just 47 days past his 18th birthday. He, along with members of his fellow fallen, displayed great acts of bravery in trying to save their injured comrades. Despite his own injuries, sustained during the first explosion that killed one of his friends instantly and left several others wounded, William assisted the Field Medic in tending to casualties. A second device detonated whilst the injured were being moved back to the relative safety of the FOB, killing three more of his friends, injuring several others and mortally wounding him. "Rifleman Aldridge arrived in the Battalion as we started our training for Afghanistan and it was clear from very early on that he was a natural field soldier who relished the challenge of preparing for the intensity and complexity of operations in Afghanistan. He has stood tall in Sangin – a selfless, capable, thinking Rifleman. He had been to the Army Foundation College, Harrogate, evidence itself of nascent talent and had got to grips with the myriad of skills needed for Afghanistan much quicker than most. He was a big going concern and was already ear-marked for more responsibility. We will miss him dreadfully and our hearts go out to his beloved family." "Although new to my company for the Afghanistan tour, Rifleman Aldridge had impressed me from the outset. Well-mannered, well turned out and very much a thinking Rifleman. Such was his stature he reminded me of an old Platoon Serjeant friend of mine from 2RGJ. There is no doubt in my mind that Rifleman Aldridge could have gone all the way. We were injured together in the first explosion. We were both injured and in shock together but he comforted me with his patience and kind words. Sadly his life was snatched by another explosion on the way back to the FOB. Another new talent, whose potential, will tragically never be known." "Rifleman Aldridge was a key part of a very close knit and battle-hardened Platoon. Although he deployed later than most, he quickly found his feet and rapidly absorbed the skills required to operate in this complex and dangerous environment. He spent the bulk of his time in Afghanistan living in and operating from a small Patrol Base in Sangin. With virtually no amenities, luxuries or creature comforts to hand, he thrived on the challenge. He was a bright, fit, popular and resourceful Rifleman who made friends easily and quickly grew proud of his Platoon and the men with whom he lived and fought. They too were fiercely proud and protective of him. He harboured aspirations to join the Special Forces and showed great promise for a long and successful career, which ended most tragically as he fought beside his friends to give the Afghan people a better life. Our thoughts and prayers are with his family." "Rifleman Will Aldridge was a quiet, well-mannered, generous young Rifleman who absolutely loved his job. He had aspirations well beyond his years. As the youngest member of the Platoon and the Company, he was intrigued by the Special Forces and desired to serve with them. He had a most promising future and was on track to take part in the next Potential Junior NCO Cadre, which I have no doubt he would have passed with ease. In this close circle of friends within the Platoon, he always talked of his family and his girlfriend Zeta, whom he loved very much. Will; you will always be remembered as an exceptionally fit and motivated Rifleman, devoted not only to his family but also to his Platoon." "Will, Remembered by all, Forgotten by none – Brother Rifleman." "Rifleman Aldridge was a keen soldier. He was an ambitious man and always with a smile on his face. He wanted to do his best at everything. He loved the Army and wanted to serve for a long time. I got to know him when we served together in a small patrol base for a month away from our normal FOB in Sangin. He always talked about his family. It will never be the same without him and he will always be in my mind. He was a gleaming bloke. He will never be forgotten – rest in peace." "I first met Will when we joined the Battalion at the same time. He was always one of the boys; cheerful, happy and always up for a laugh. He was obviously hugely proud of being in the Army. I will always remember him as one of my brothers. Love you, Big Ginge." "Will and I have known each other from training, and he hasn’t changed since then. He’s always been a happy, loving and very proud soldier. We have so many good memories together before coming out to Afghanistan – like him trying to use my bath as his bed after a good night out! He will always be on my mind and in my thoughts, as will his family and friends. I’ll see you again one day brother, but until then – you just rest in peace." "I was that which others did not want to be. I went where others feared to go and did what others did not want to do. I asked for nothing from those who gave nothing, and reluctantly accepted the thought of eternal loneliness should I fail. I have seen the face of terror, felt the stinging cold of fear, and enjoyed the sweet taste of a moments love. I have cried, pained and hoped, but most of all I have lived times others would say were best forgotten. At least I am proud of what I am... I AM AN INFANTRY SOLDIER.."